Hello, my name is Amy. 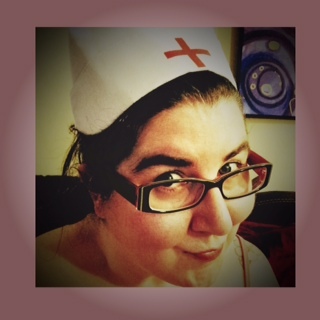 I am a nurse. As a nurse with over 10 years of hands on experience dedicated to improving the way we care for seniors with Dementia and Alzheimer’s Disease. Nurse Bitterpill is a real glimpse into how dementia patients communicate. After years of caring for beautiful, unpredictable, and fragile minds, as well as the inevitable failing of their bodies, I have discovered that one of my true passions in life is to bring joy and life back to those living with Alzheimer’s one moment at a time. My patient’s call me many names, but my favorites are: The Dancing Nurse, Patch Amy, and the occaional mi hija. Describing my job is difficult because what I do changes from minute to minute. There are days that I am a sheep dog, keeping the flock safe from themselves and the occasional rogue wheelchair bandit. Some days I am a cat-herder, trying to organize the chaos knowing it’s futile. Other days I become what I call a therapeutic liar (or possibly, curator of make-believe). And then there are the occasional days that I am a full on superhero-like ninja warrior saving little old ladies from mayhem and destruction. My job is never dull. I embrace every surprising moment of it. I have always wanted to be a writer. From the time I was six years old I was writing songs, poems, and stories. When I found myself in nursing school writing papers for English class, that long hidden but never forgotten passion was reignited. My love of short stories and poetry grew. It really wasn’t until I started working behind the locked doors of a typical memory care unit that I was truly inspired to put words to paper, or computer as the case may be, in a non-fiction way. The souls that I care for are a constant source of inspiration for me. My army of muses never cease to amaze me with their stories, actions, and words. Learning about their rich lives and loves has given me great perspective on how to individually care for them. They have brought me out of my insecure shell about writing the truth I see in people, allowing me to do two things I absolutely love: heal people, and write about healing people. It is my privilege to provide love and hugs to these members of society that are often tossed aside and seen as heartbreaking, tragic. I listen to their stories, learn from their lives. Sometimes the stories don’t make any sense. But if you really listen, they are telling you who they are, who they once were, and who they still strive to become. Even gibberish can tell a powerful story. This blog is a brief and often humorous glimpse of life inside the mind of Dementia and Alzheimer’s Disease. The Alzheimer’s Quote of the Night began many years ago as a way for me to shine some light onto the demented world that I live in every night. People kept asking what it was like to work with such folks. So I began posting quotes from my patients, some beautiful, some strange, to my personal networking sites. The response was amazing and encouraging, prompting me to start this blog. My goal is to bring humor, happiness, and fun into the lives of the people I care for. In that respect, I also aim to bring that humor and lightheartedness to the brave, unwitting souls who act as caregivers to their family members and loved ones, to those afflicted with Alzheimer’s and many other forms of Dementia. Humor has always been my favorite form of medicine. I firmly believe that the reason my patients relate so effortlessly to me is because I put them at ease by employing humor, dance, music, hugs, kisses, and a constant smile into my care. Treating each patient as a human not a disease. These are their words. They are the stars of this ever evolving story. For more information on Alzheimer’s Disease please visit the Alzheimer’s Association website. Thanks for sharing with me and other who will benefit in many ways from your talented writings! The very best to you, Amy. Thank you, Vickie. I am so glad you and your mother have touched my life and my creative soul.